Annual wellness exams are an extremely important part of your pet’s overall healthcare. Every pet is unique and we work with you to develop a wellness plan individually tailored to your pet’s specific needs. We begin with a comprehensive nose-to-tail physical examination to assess your pet’s overall health. We then recommend appropriate vaccinations, diagnostic testing, diet and parasitic management for your pet. Your pet’s annual wellness checkup gives us the opportunity to listen to you and your concerns, answer your questions, thoroughly examine your pet and update you on advancements in veterinary care. Preventive care is the best way to promote a healthy lifestyle and ensure your pet stays well. Up-to-date vaccinations play a large part in keeping your pet healthy and free from disease. At Ravenwood Veterinary Clinic we customize vaccination schedules based on your pet’s age, lifestyle and potential for exposure. We want you to be comfortable with our recommendations and we are happy to discuss all options with you. We offer same day acute care appointments on a first call first serve basis. We have a limited number of appointments available each day, which are usually completely booked by mid-morning. These appointments are only made available the morning of, and we are open to receive phone calls at 7:00am. Acute care appointments are designed for same day, sick visits. Senior pet care is an important part of our commitment to the life of your pet. 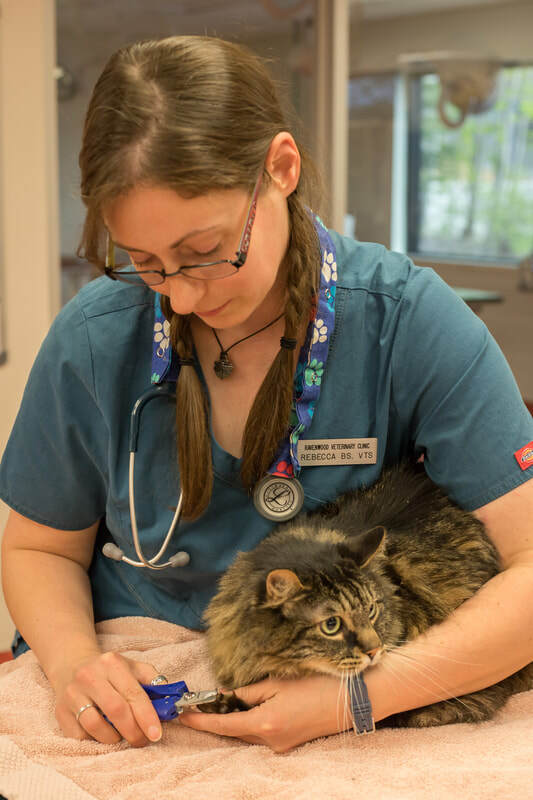 Regular senior wellness exams help us detect, diagnose and treat problems in older pets before they become advanced. With important information from you about any changes in your pet’s daily habits, behavior, energy, appetite and mobility your veterinarian will perform a thorough physical exam to assess your pet’s hearing, vision, teeth and musculoskeletal system. Just like human medicine, veterinary medicine is always advancing, and Ravenwood Veterinary Clinic stays abreast of new technologies and therapies as they become available to help your pet live a longer and healthier life.